"Helen Miller Gould" redirects here. For the schooner, see Helen Miller Gould (schooner). For her niece, the socialite and philanthropist, see Helen Vivien Gould. 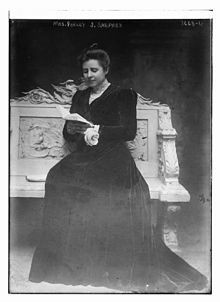 Helen Miller Gould Shepard (June 20, 1868 – December 21, 1938) was an American philanthropist born in Manhattan in New York City. Born as Helen Miller Gould, she was the first-born daughter of Jay Gould and Helen Day Miller (1838–1889). Her sister Anna Gould was another prominent heiress. She attended New York University School of Law, and she married Finley Johnson Shepard (1867–1942) on January 22, 1913. Helen Anna (named for Helen and her sister, Anna). Helen had also cared for her brother Frank Gould's twin daughters, Helen Margaret and Dorothy (b. 1904) by his first wife, Helen Kelly. In 1918 she and Emma Baker Kennedy (c. 1833–1930) became the first female vice presidents of the American Bible Society. At the commencement of the Spanish–American War, she donated US$100,000 to the United States government in support of the war. She gave an additional US$50,000 toward military hospital supplies and was active in the Women's National War Relief Association, working in a hospital for wounded soldiers. She donated the library building at New York University and began the Hall of Fame. She gave US$10,000 for the engineering school. She gave additional contributions to Rutgers College. Both the YMCA and the YWCA benefited from her contributions, as well as other organizations. She was a member of the board of the Russell Sage Foundation and of the national board of the YWCA. She purchased Shepard Hills in Roxbury, New York, including Kirkside Lake. The facility originally produced ice for the Roxbury in the winter months and the lake was used for recreation for the community in the summer months. Construction of the 9-hole golf course began around 1916 and upon completion served her estate. She died on December 21, 1938 and was buried in the family mausoleum on December 23, 1938. ^ "Useful Daughter". Time. January 2, 1939. Retrieved 2007-06-18. When the late Jay Gould, maker and breaker of railroads, lay dying, his devoted daughter Helen, then 24, was a constant attendant at his bedside. Last week at Roxbury, New York, Jay Gould's birthplace, she died, after a stroke, an extraordinary daughter of an extraordinary father, of an extraordinary family. ^ "Helen Against Revolution". Time. January 25, 1932. Retrieved 2008-07-30. It was not until 1913 that she married Railman Finley Johnson Shepard. ^ "Helen Gould Weds. Her Hudson Home a Floral Garden for Her Marriage to Finley J. Shepard". New York Times. January 23, 1913. Retrieved 2007-06-18. ^ a b c Rines, George Edwin, ed. (1920). "Shepard, Helen Miller" . Encyclopedia Americana. ^ Snow, Alice Northrop (1943). The Story of Helen Gould. F. H. Revell. ^ "Mrs. F. J. Shepard Dies of a Stroke. Former Helen Gould, Famous for Philanthropy, Stricken at Her Summer Home Gave Away Much of Fortune. Mrs. Finley J. Shepard Is Stricken at 70. Philanthropist and Daughter of Jay Gould Got Permission to Marry. Wed at Lyndhurst. Benefactions in War With Spain. Descendant of Pioneers". New York Times. December 21, 1938. Retrieved 2007-06-18. Mrs. Finley J. Shepard of New York, the former Helen Gould, who was famous for her philanthropies in many fields, died at her Summer home here at 12:15 this morning, after being in a coma for more than 24 hours. She had suffered an apoplectic stroke ten days ago, and had been ill for two months. Her age was 70 years. Wikimedia Commons has media related to Helen Miller Gould. This page was last edited on 2 March 2019, at 18:58 (UTC).